This is as close to an Irish inspired meal as you will get from me. I know the food blog world will be filled with recipes for corned beef and cabbage over the next few days, but as a Sicilian girl, I can honestly tell you that I have never in my life eaten corned beef, much less thought about cooking it. It's one of those meats that never looked appealing to me. I must admit that I did see some some corned beef over at Sticky Gooey Creamy Chewy that made me want to try it. I do look forward to the week of St. Patricks Day, not because of the food or green beer but because I have several friends whose birthdays fall during the week, as well as my own, and because March 19th is St. Josephs Day, and if you're Italian or Sicilian you know that mean zeppoles. For the past 26 years I have brought my Dad (Joseph) one of the only pastries he loves. Sweet fried dough, filled with a rich custard and dusted with powdered sugar. Although it's one of the rare sweets I don't care for, knowing that my Dad looks forward to his zeppoles every year makes me happy. I had been promising my friend Mitchell that I would make a Guinness pie or stew for quite some time. I first found this recipe on Culinary Disasters. Obviously it didn't look like a disaster to me so I decided to make it for a late lunch today. Mitch helped John dig a hole in the yard, and also helped me with some garden projects, so his payment for today was Steak & Guinness Pie. This is a Jamie Oliver recipe. I used chuck roast since I didn't have a brisket (which the original recipe called for), and because it was on sale. John and Mitchell thought it was "freakin' fantabulous" (that is a direct Mitch quote). It really had a wonderful flavor and the crunchy top was my favorite part. Preheat the oven to 350. Dredge the piece of chuck roast in flour and shake off the excess. Over medium heat in your favorite oven safe large pan (cast iron works great) cook the bacon then remove leaving the grease in the pot. Salt & pepper the chuck roast pieces. Raise the heat to medium high and add it in batches. Brown it all over (about 4 minutes). If the pan starts to dry up, add a little bit of butter. Remove and set aside. Dump all but 1 tablespoon of fat out of the pan. Add in the onions, carrots and celery. Salt & pepper to taste. Cook until the vegetables are softened, about 5 minutes. Add the mushrooms and cook until softened. Add the garlic and cook one more minute. Now add the Guinness and bring to a boil making sure to scrape the bottom of the pan to free up any of those tasty bits. Add the stock, rosemary, thyme, bacon, and chuck roast back into the pan. Put the pan in the oven, uncovered and cook until the chuck is tender (about 1 1/2 to 2 hours). Check the meat every 30 minutes and add more beer or stock if necessary so the pan doesn’t dry up before the meat is done. Once the meat is finished remove the pan and add in the cheddar cheese. Raise the oven heat to 400. Butter a pie pan or another dish that is 8x10 and at least 2 inches deep. 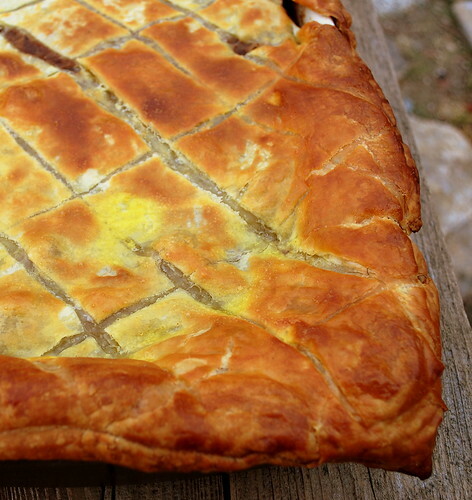 Roll out a sheet of puff pastry big enough to cover the bottom of pan with a little overhang. At this point I put the bottom crust into the oven for about 6 to 8 minutes, just to cook it a bit so it wouldn't become soggy. Cut a little slit in it so it won't puff up on you. 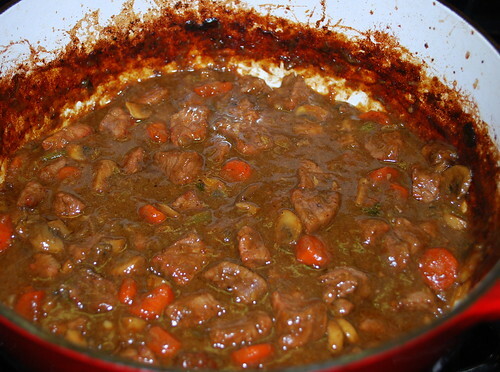 Remove from the oven and pour the beef mixture in the pan. Roll out the second piece of puff pastry making it large enough to cover the pan. At this point you can score this piece, making it pretty and decorative, being careful not to cut all the way through. I used a criss-cross pattern. Place on top of the pan to cover, pushing down edge to seal. Brush the top with the egg wash. Place in oven and bake until golden brown, about 30 to 40 minutes. I think you missed the step where you add the stock, rosemary, thyme, bacon, and chuck roast back into the pan. According to Culinary Disaster it comes just after you've added the Guinness and let it come to the boil, and before you put it into the oven. Ooops thanks Lisa. I just corrected that. Thanks for letting me know. Recipe corrected. Wow... this looks amazing. Guess I know what we are having on Tuesday for dinner. Yum!! Oh yeah. Steak and Guinness pie is crazy good! I'm going to have to make some. By the way, I just bought some Zeppole's at the Italian Market last week. They are so great. You might enjoy watching Clara cook. She's 93 years old and her parents were Sicilian. She lived in an Italian community outside of Chicago near my childhood home. She's a hoot. Here's a link to her making Cucidati, Italian fig cookies. Suzanne I have seen Clara, she's a peach. We make Cucidati for Easter, so watch for that post coming up. Regi - let me know how your pie comes out. It was so easy and really tasted wonderful. It must be the Guinness that gives it such an amazing taste. Todd - thanks! I was married to a Murphy first time around, so I know all about the Irish, lol. Online Pasty Chef - thanks for the kind words! 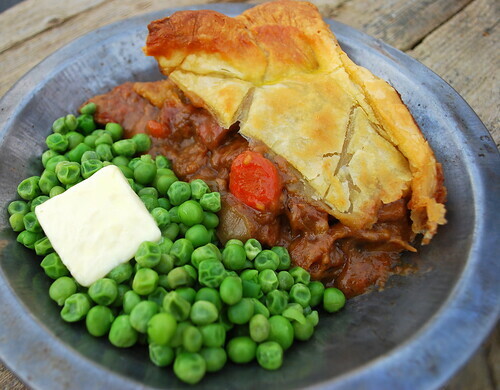 That steak and guinness pie looks so good! ooh i'd love to see the pics, but it says currently unavailable. happy early b-day! Bren sorry about that,,,,anyone know why that would happen. I can see them??? Lisa this is devine! I have to make this, seriuosly, I have to make this!! Looks pretty Irish to me!!! I had something like this in an Irish pub in Moncton, New Brunswick! That looks absolutely fantastic and far more appealing to me than the title would have indicated. One of those delicious surprises. Nice photo at the end too. I've had corned beef and my mom used to make corned beef and cabbage, with carrots and potatoes, in the crockpot a few times per year. Good stuff. Never thought to make it myself though. Oh yum, this sounds awesome! Nicely done and love the pictures! My husband is the original meat and potatoes guy and doesn't typically like stews because of the veggies in them. He is currently in Ediburgh and called to tell about this steak and guinness pie with the amazing pastry crust and not a vegetable in sight! I googled it and found your site. Question is could I leave out the carrots and maybe even the celery? I do alot of cajun cooking and always leave out the celery. Mushrooms, onions etc. are fine just not the carrots and celery! Would this recipe work that way? Lucy - Yes I'm sure you could leave out the carrots and celery and it will still be delicious. Let me know how it turns out. 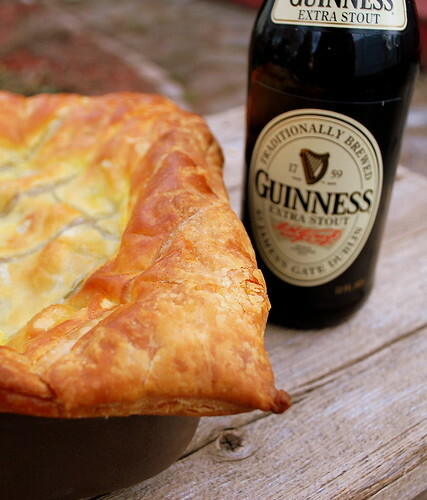 I'm putting together a recipe roundup for HuffPost Taste on all pot pot pie recipes and would like to feature your steak and Guinness pot pie. Can we have permission to use the photo? We'll link back to the blog post. Joseph - YES!!! Thanks so much!